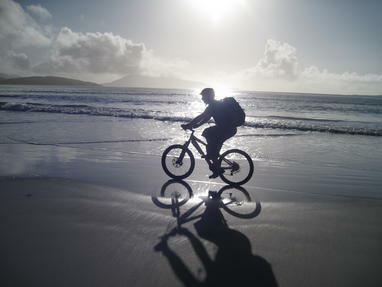 Can there be a better way to see the stunning Outer Hebrides than from a bike? From an afternoon exploring the ancient Callanish stones to an exciting trail ride through the Harris hills, being on a bike is a great way of enjoying the islands. NEW FOR 2012 we have a small fleet of sit-top Kayaks, once you're done on terrafirma why not take to the seas to explore Lewis's stunning coastline. We are now based in Uig, a region nestled between the pentlands and the Harris hills dotted with stunning sandy beaches and sparkling lochs, its the perfect place to be in nature. We can arrange hire from Uig or for a little extra from your accomodation. We do have a small number of bike racks for hire which fit most cars should you want to explore further afield. Please note we are a small company and it can sometimes take a little while to reply to e-mails.